This article is from the Tea & Coffee Trade Journal (Aug '07). This publication contains many interesting articles on both tea and coffee. It is a great place to learn about tea and the growing regions. Tea grading is one of the most complex topics in the industry. Specialty imbibers are routinely confused about the topic. Randy Altman explains this intricate classification process. There is no universal standardized grading system employed throughout the global business, and even those systems that do exist are often more art than science. Companies also occasionally fool around with grades, giving an exalted grade to an average tea. However, perhaps the most well-known grading system in America is actually based not on quality, but on leaf size. This system revolves around the classification of Pekoe, for which the letter “P” is the designation. Pekoe simply means a whole leaf was used in the manufacturing process. There is in the “P” grade no meaning of quality. The system that uses Pekoe as its base refers mostly to tea from India and Ceylon, almost always black tea. The next grade, and they do come in steps or a series, is “Orange” making for “OP.” This is a slightly larger leaf that may also be thinner. The word “orange” certainly adds to the confusion, as the color bears no relationship to the use of the term. Many tea books or experts in lectures will say the term derives from the Dutch royal family Orange Nassau, but actually the origin is obscure and this is just a convenient guess. Perhaps further confusing to Americans and Europeans is the grading system under discussion mainly reads from right to left, the opposite of everyday text reading, which is left to right. The next designation starts to enter the quality realm. The subsequent appellation is “flowery” and hence we have “FOP.” And yes, more room for confusion among the retail consumer, since this “flowery” does not refer to any flower, rather the unopened bud of a tea leaf. All tea plucked by hand should at a minimum be “FOP,” as a generalization. To review, FOP stands for Flowery Orange Pekoe. Tea can be yet more glorious, and here the exalted grades return to the beginning “P” and are placed to the right of the “P.” Probably the most common designation is the number 1, for “SFTGFOP-1,” and I have certainly gotten samples of this grade from Darjeeling that merit the label. Some companies are not satisfied with the humble number, and add terms like “extra special” or “extra fancy” for a really long grade of “SFTGFOP-Extra Fancy.” I have no idea what percentage of specialty tea so graded actually deserves such lofty titles. If a company over-grades, the specialty imbiber can vote with their feet and change shops, catalogues or websites. This grading system is much more complex than the above discussion implies, primarily because tea leaves are so often chopped up into pieces. The size below pekoe is “broken pekoe” or “BP” and yes, you can have for example, a golden flowery broken orange pekoe, a “GFBOP.” The next lower size is fannings, and finally there is dust. Fannings and dust are almost exclusively for tea-bags of the regular size tea-bag. Here is one of the most commonly held myths about tea grades. I hear this one all time. The myth is that dust and fannings are somehow bad tea. The best tea will yield some percentage of dust and fannings. These fannings and dust will make a good brew, not the greatest, but a good brew. Now, freshness must be factored in more with dust and fannings than with whole-leaf teas, because the tiny particles have a worse surface-to-air ratio and lose freshness faster. The exalted grades of these black teas are more art than science. As with any super-premium tea, these tend to come from named estates. The retail consumer needs to be aware that a purchase one year that is perfectly satisfying does not signal the estate will automatically produce such a fine tea in following years. Many variables can intervene over time, something as simple as not enough rain. Some variables associated with quality tea have nothing to do with grading, such as organic, kosher, and FairTrade. This is yet another potentially confusing aspect of grading to the paying imbiber. This discussion over-simplifies this one grading system, but covers the basics. I will venture into the weird rule of most connoisseurs that “pekoe” be pronounced as “peck-oe” and such pronunciation is taken as sign of a true aficionado. I have studied ancient language up to the post-graduate level, although not Chinese, where the word originates. I own two giant dictionaries with very long distinguished names, too long to mention, and both show only one pronunciation for the tea word “pekoe” and the proper usage is as the word looks like it should be verbalized, “pee-koe.” Tea books often go out of their way to mention to show your tea intelligence by saying “peck-oe,” but I swear I remain counter-trendy as per my beloved dictionaries. Mention should be made of a few differences between Darjeeling and South India. Darjeeling follows the “pekoe” grading system rather closely, more closely than most other regions. You might see a “CL” suffix, which stands for “clonal” and again this is not necessarily a quality plus, but in my experience it usually means the owner is paying good attention to the tea plant. The main complicating factor with Darjeeling is that it has distinct growing seasons. “First Flush” are springtime teas, and the word most often associated with these young leaves is muscatel. The next round is “Second Flush” and is more mature, which is a plus if you prefer this. 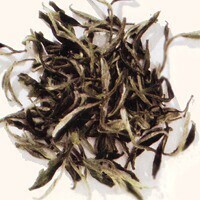 Sometimes a third round is mentioned, called “In-Between Darjeeling” and is harvested in April and May. Finally, there is a last round, called “Autumnal,” known for its large leaves. A completely different system of grading is used for green tea. Actually, multiple systems are used for green tea, and again we must over-simplify, but will cover the basics. Here, grades closely refer to quality, especially when employed by Japan. The following is the Japanese system. The lowest grade is Kukicha, and is in fact made from the twigs and stems of the tea plant, and historically given to children and seniors, and is not usually sold in America. The next higher grade is Bancha, and is still rather low in quality and not sold, at least should not be sold, by specialty tea companies. The third grade is Sencha, and now we have a very wide range. The specialty tea buyer needs to be careful if paying a lot of money for a product labeled “sencha” as this may or may not be appropriate. Japanese sencha can be superb, and now China and Viet Nam make sencha, with more mixed results. The next higher grade, a truly wonderful experience, is Gyokuro, which is usually translated as Pearl Dew. This tea is very labor-intensive, and is shade-grown for part of the year. This tea is expensive, but worth it. The quantity is low, that is, a small output, picked but once a year, with small, tender, extremely fragrant leaves. The fifth grade, the highest, is matcha (often spelled “mattcha”). This is simply the best gyokuro pulverized into a fine powder and used during the famous Japanese Tea Ceremony. Here, the tea is not steeped, but whisked directly into the water, making a frothy brew of delight. China is a huge nation, unlike Japan, and has hundreds and hundreds names for tea, without a real system. These names reference estates, but the translations of the names often refer to the appearance of the leaf, not a location or owner. The closest thing to a grade of tea in China is “Hyson” or “Young Hyson,” and all sorts of teas are thusly labeled. “Hyson” was not originally even a category of Chinese tea, but the name has caught on and become trendy. If you are dealing with a good specialty tea company and it lists a Hyson, odds are the Hyson will also be satisfactory. As for superlatives used as adjectives, like the “extra fancy” for black tea, the term “Imperial” is sometimes used for Chinese. Grading tea reflects the fascinating and idiosyncratic history of tea. Tea has a rich cultural and social heritage. In some ways, tea is simple, almost all quality specialty product is from two leaves and a bud. Complexity quickly arises, however, and the tea trade has an obligation to educate consumers about whatever grades it employs. Bringing the customer into the loop will more tightly link the specialty imbiber with the shop, catalogue or website. Randy Altman, in addition to being a knowledgeable writer on the subject of tea, has also advised the United Nations and other transnational organizations, and has held directorships and office positions at various non-profit corporations. He also holds several adjunct academic appointments.